The special joint event organised by the Frontline Club and the BBC Arabic Service brought together some of the key players, journalists and experts to discuss what has taken place in Egypt over the last few months. 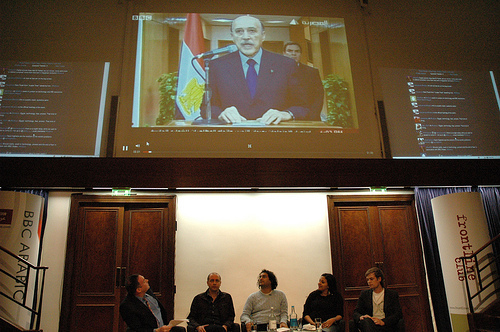 The first half of the evening at the Royal Institution of Great Britain, considered the role of technology in the Egyptian revolution and the panel resoundingly downplayed the role of Facebook, Twitter and even the Internet. Alaa Abd El Fattah, an open source software developer, summed up the mood early on by stating that Egyptians used their "voices", "rocks" and "clubs" more than they used technology. He didn’t mention his work aggregating Egyptian blogs or building websites for activists at any point in the evening. Manal Hassan is the co-founder of the Egyptian GNU/Linux Users Group. She said that social media tools were simply "the tools of this generation" and that the revolution would have taken place with whatever tools were available. Continuing the theme, Louis Lewarne, who ran occupiedcairo.org, was unconvinced about the power of the Internet. Although he collected contributions, comments and images on the blog during the revolution, the use of technology was always "a reaction" to events, he said. When the Egyptian authorities clamped down on the Internet he noted that it encouraged more people out onto the streets because they wanted to find out what was going on. Lewarne also played down his role setting up an ad hoc media centre using one of the few working Internet connections in Cairo, even though he was circumventing the state media narrative in a way that wouldn’t have been possible in days gone by. It was a panel about technology that didn’t want to talk about the role of Facebook, Twitter, the Internet or mobile phones. For these digital activists, it was the obvious way to communicate and a normal thing to do. Instead, they wanted to talk about the extraordinary political change that had swept through their country. And who can blame them? "I guess [the] audience could tell we didn’t really want to talk about media and tech rather we wanted to talk revolutions"
"Being in Tahrir and being part of these discussions and this unity…it was different." You didn’t think about audiences or the international dimension, "you just thought about your country", she said. Only Sam Farah, the lead presenter of BBC Arabic’s flagship interactive programme, Nuqtat Hewar (Talking Point), really discussed the workings of the new media landscape. He noted that Egyptians were sending BBC Arabic material and that "old media" were playing an important role in amplifying discussions that were circulating on new media platforms. El Fattah noted that Al-Jazeera played a "very important" role in that respect.